In one corner, we have a cute and fuzzy ‘lil bunny wearing a blue jacket with pointy ears and a precious smile. In the other corner, we have a human being who hates all fun and happiness and wants to selfishly keep the adorable bunny out of his garden. In Sony’s latest half animated/half live-action hybrid, Peter Rabbit, the winner quickly becomes clear (spoiler: Everyone’s a winner!!). 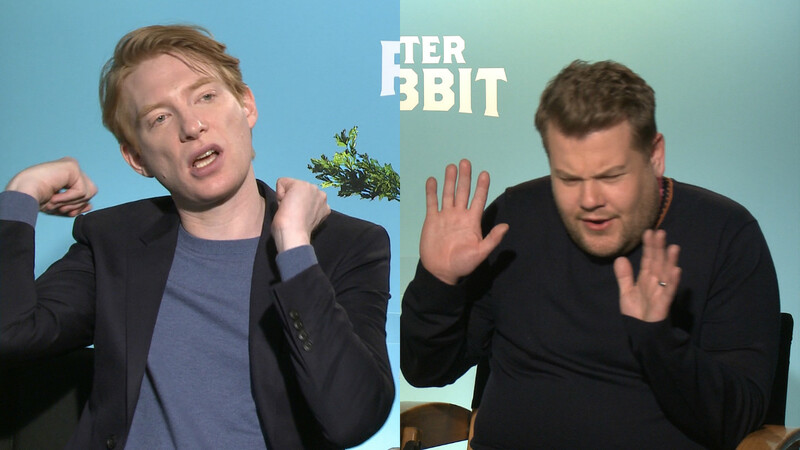 But now take these two fighters out of the idealistic, woodland world and who’s going to win in a fight — James Corden or Domhnall Gleeson? James “hosts a talk show five nights a week” Corden voices our titular hero, the bunny Peter Rabbit — and he voices the character with ease, making you wish all bunnies could make jokes and burst into song. As for Domhnall “was in both Star Wars and mother! this past year” we get a completely new side to the actor, as he plays a downright evil and scorned toy store manager, Mr. McGregor. When Peter Rabbit threatens Mr. McGregor’s perfect world, it’s all out war. And offscreen, who’s the victor? HelloGiggles sat down with Corden and Gleeson to ask the tough question, and you’ll be surprised to know both gave completely different answers. According to Corden, the two would not partake in a battle mano-a-mano. As for Gleeson, Corden would win jk, they wouldn’t fight. If you want to see who ultimately wins the battle for control of Mr. McGregor’s garden, Peter Rabbit hits theaters on February 9th.